Who does the preaching of the sermon at the midnight mass on Christmas Eve instead of the priest? Please wait for the picture on the left to appear. 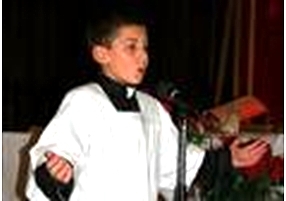 A boy or a girl, normally aged 7 to 10 years old, does the preaching of the sermon at the midnight mass instead of the priest! ‘The Preaching of the Child’ or 'Priedka tat-Tifel' is an old and popular tradition that has taken place in churches since 1883. A boy aged between 7 to 10 years will be chosen mostly from among altar boys months in advance, to preach at the midnight mass in front of the Parish Priest and a packed church. The child has to learn the 10 to 15 minutes sermon off by heart. The child will narrate the scene of the birth of Baby Jesus, and remind the young and old alike to be kind and fair with other people and also to be aware of other people’s needs. After the ‘Preaching’ the Parish Priest gives a present to the child and it will normally be a statue of Baby Jesus in a crib. “Merry Christmas” in Maltese is: “Il-Milied it-Tajjeb” ( eel meelid ittayyeb). Houses are decorated with Christmas Trees, a tradition brought in during the British rule and the Nativity Scene locally called “presepju” (pronounced presepyou), a tradition brought in from Italy, Malta’s neighbour country. In Malta, it is traditional to sow wheat seed on cotton buds in flat containers five weeks before Christmas. The buds are left in dark corners in the house until the seeds produce white grass-like shoots. The containers with the fully-grown shoots are then used to decorate the crib or the statue of Baby Jesus. Many houses in Malta place a crib with the statue of Baby Jesus in it on a window sill facing outward to be seen from the street. Long time ago in the Maltese Islands, many farmers used to look ahead, to know what kind of weather lies in the months that followed. So twelve days before Christmas (each day represents a month; example: 13th Dec marks January, the 14th Dec marks February, and so on), the kind of weather that will be on that particular day, will represent how the weather will be in that particular month of the following year. The period from 13th - 24th is called “l-Irwiegel” which comes from the word “Rules”. So if on 13th Dec it’s rainy, January will be a very rainy month, and so on. Although that tradition is old, you still find people who keep track of the weather during that period. Malta is a Christian country, therefore most of the Christmas activities centre around the Church. The most important time comes 9 days before Christmas. That time is called “Novena”. 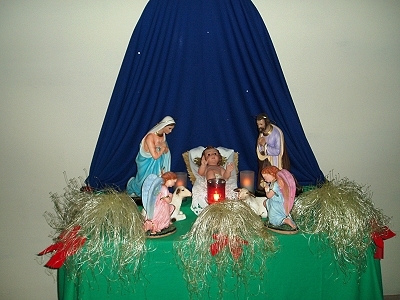 Here the Church prepares all believers to concentrate on the birth of Baby Jesus. The Novena takes place from the 15th until the 23rd December. The focal point in the church is the statue of Baby Jesus in a crib on the main altar in church covered by a white cloth. It is uncovered just before the Midnight Mass to mark the time that Baby Jesus was born. On Christmas Eve when the weather permits, children of all ages gather together accompanied by adults; to make a procession around the village with children carrying a crib with the statue of Baby Jesus on a pedestal, and singing Christian hymns and carols. The children take turns to carry the pedestal, while other children carry lanterns and placards with Bible texts about the Messiah. This tradition has been held since 1921, by a holy Maltese priest, St. George Preca, who wanted children to make a demonstration in honour of Baby Jesus. 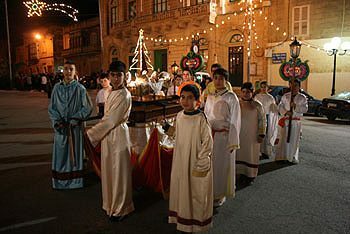 Every town and village in the Maltese Islands organises this procession. Malta has its own traditional Christmas Carol that is sung every Christmas. The carol is “Ninni la Tikbix Iżjed”, that in English means: ‘Sleep and cry no more’. This carol was written by a priest 2 centuries ago for Maltese migrants in North Africa. The Maltese Christmas dinner is a special event that no one wants to miss! They eat turkey, “timpana” (maccaroni encased in crusty pastry and baked in the oven), baked potatoes and large variety of vegetables. If not a turkey, the Maltese like to present the fattest chicken for the Christmas dinner, along with the fattest pork leg. Sweet foods include the ever popular Christmas cake and mince pies. The local traditional sweet food is ‘the honey ring,’ made from a mixture of honey and treacle in sweet pastry and formed into rings. It is very delicious to have with coffee or a hot cup of cocoa. The last feast is that to be celebrated on the 6th January- the Epiphany, and now here in the Maltese Islands we celebrate it in the first Sunday after the New Year, commemorating the adoration of the three Wise Men. By the 6th January all the Christmas decorations are put away for the next Christmas. We are starting our calendar this year with facts and information about two countries. Follow this link to our second country.